In celebration of Gracie’s birthday coming up, I have decided to host a giveaway on her Instagram account (@gracieeethecorgi). One lucky pup will be chosen to win a gift basket filled with some goodies from some of my favorite shops! If you are interested in entering my giveaway, see below for details! 4️⃣ Public accounts only! The giveaway ends on Gracie’s birthday, December 16th at 11:59 PM. The winner will be drawn on December 17th! 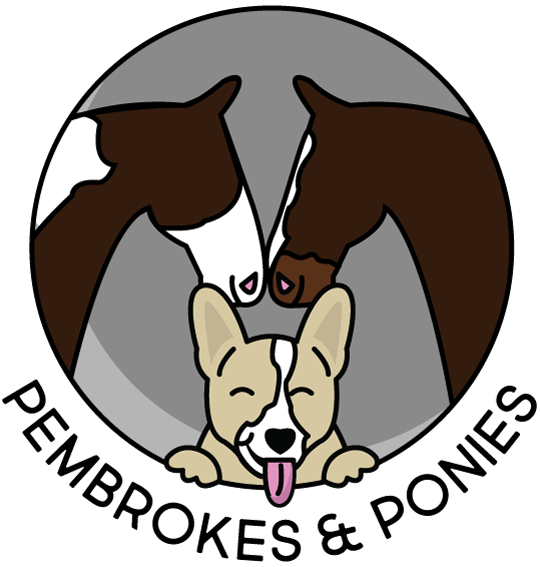 Like the name of my blog suggests, ponies (well horses) and Pembroke Welsh Corgis are the two loves of my life. They help keep me sane in this crazy, busy life of mine! Now that you have been introduced to my two wonderful ponies, Diesel and Diablo, I feel that it’s time to put the spotlight on the other love of my life: my corgi, Gracie! However, I have been struggling with her fear of interacting with other dogs after she was attacked and strangled by another dog at a boarding facility when she was around a year old. I trusted this boarding facility, which I will not name for privacy reasons, with taking excellent care of her while we were on our first vacation without her. In return, the social and playful dog I dropped off was returned to me with bloodshot red eyes due to strangulation, a bite wound, and fear after being cornered and attacked by another dog. The worst part is that this “facility” never even notified me that she was hurt. What a great way to be greeted when coming back off of vacation! Ever since then her fear of other dogs approaching her has continued to progress. Living in fear is no life at all. I have been working on building back the confidence that she lost after she was attacked, but it has been a slow process. I recently decided to seek the help of a professional dog trainer to help her further as I don’t have the skills needed to help her fully. Battling fear is not an easy feat. I thought that blogging her progress might be helpful to others who are dealing with fearful dogs – it is tough to do alone! Especially, when other owners don’t take the time to properly train their dogs or work with their aggressive dogs. You can only control how your dog will react. We had our first consultation the other afternoon with the wonderful owner of Sit Happens Dog Training, Tina Spring. In our first session, Tina sat down with me and discussed all of the options that we can try to help her overcome her fear. Some of those options included: changing her diet, using pheromone collars to help calm her mind, using training techniques that employ classical conditioning methods, and trying calming medication. We also discussed taking her to the vet office where I work and doing a blood test on her to rule out thyroid issues since they frequently occur in corgis and can cause intense anxiety and fear. I will start off by giving you a little background information to help you to follow along with my rambling. After speaking with the Tina, I decided to go ahead and try a combination of a few of her suggestions. I will start off by saying that I am personally not a huge fan of immediately medicating dogs without trying other options first. Since I work at a vet clinic, I decided to ask my boss’s opinion and he agreed that medication should be the last option. That being said, I chose to try changing her diet, using a pheromone collar, and working with the trainer to develop a bi-weekly program to help her conquer her fears. I currently feed Gracie Fromm Gold Holistic Adult dry dog food, which I absolutely recommend to anyone who wants to give their dog a wholesome and healthy dog food. It is not easily available where I live, so I order it through SmartPak! I have personally had great results when feeding the food such as a shiny coat and great body condition. It is a great, wholesome dog food that uses real ingredients and meat instead of all of the by-products. I will include the list of ingredients and the guaranteed analysis down below if you are interested. Despite how much I love this food, Gracie has been slowing down on her eating. She is notorious for going off of her food when she gets tired of eating the same food for too long. She is just a picky eater! Tina suggested that I give Wellness dog food a try. After doing some research on the brand and the different food options they have, I decided to try alternating between Fromm Gold and the Wellness Core Grain-Free Original food. If you aren’t familiar with rotating foods, I definitely recommend that you go out and read some of the research supporting it – especially if you have a finicky dog. I am going to try rotating her food bi-monthly to keep her interested and provide her with different nutritional values to maintain a well-rounded diet. I will, of course, keep you updated on how well that works out for her as this will be my first time trying both the rotating schedule and the Wellness dog food. I will include the ingredients of the Wellness food down below if you are interested in seeing it’s breakdown! I also decided to try using a pheromone collar to help control her anxiety before turning to medication. There has been some great research behind using these collars, and there is no evidence of them having any bad side-effects unlike most of the calming medications on the market. I figured that it definitely couldn’t hurt to give them a try. If you are not familiar with pheromone collars, they produce a synthetic dog appeasing pheromone similar to the pheromone that their mother produced when they were puppies. This pheromone has a calming effect on the dog, which can help them adjust to new environments and stressful situations. I decided to try out the Adaptil Calming Pheromone Collar as it is the one that has the most research behind it. You can buy it on Chewy for $17.89, which, honestly, is not too terribly expensive. She has been wearing it for about four days now, so it is a little too early to tell how it works in the long run. I do have to say that she definitely seems calmer in general while wearing it. If your dog is easily stressed, I would definitely say that it would be worth giving a try! Before I get into it, the exercise I want to share with y’all I want to state that this exercise is the intellectual property of Tina Spring at Sit Happens Dog Training – it is not mine. Now, to round out this long post, I decided that I would share this particular exercise as it is very easy to do and is basically the foundation for dog training. It looks super simple, but it is such a great tool to use when in distracting situations where you want to teach your dog self-control and to listen to you instead of their instincts. To be honest, Gracie is extremely good at it since she was taught this exact exercise in puppy school. It is just a good thing to continue to practice nonetheless. The goal is to use this training technique during exposure exercises when we start conditioning her. I will provide a link to the video where Tina will demonstrate the exercise so that maybe you can get on the right track with your dog! Knowledge is power! I hope that this post was helpful to all of you dog owners out there! I can’t wait to update y’all on Gracie’s progress towards living a confident and worry-free life!